An-Xileel Invader is a common Agility creature card. It is part of the Core Set. In addition to the card's availability in the Core Set, three copies are included in the Dagoth's Might theme deck, and two copies in the Black Marsh Smugglers deck. "I smell the blood on the waters." "To the mud we all return." 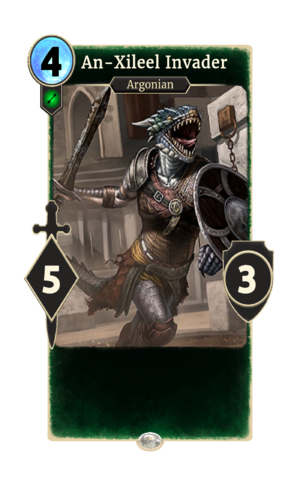 The card's name refers to the An-Xileel invasion of Morrowind after the Oblivion Crisis.